A corrupted 'Plague Marine' encountered during the later stages of the Vraks campaign, affiliation unknown, although its ancient pattern of armour indicates a connection to the Death Guard Traitor legion or one of its sub-factions, most likely the Apostles of Contagion. Although this ancient suit of Power Armour has been corroded and corrupted almost past recognition, its structure still bears the hallmarks of the older style MkIII 'Iron' Pattern suits favoured by the Death Guard legion during the pre-Heresy era. Even though more modern suits had become available to them, the Death Guard retained a large stockpile of this heavier pattern, preferring it for both its durability and the ease with which they customised it to better handle the rigours of the toxic battle zones in which the Legion excelled. This armour suit has clearly suffered severe corrosion and structural breaches over its millennia of service and has been further modified with a heretical pattern 'open vent' reactor backpack, blasphemous iconography and has swelled to contain the monstrous bulk of its occupant. At some point this armour has suffered catasrophic damage to the belly plate. The extent of armour penetration would indicate it was caused by a power weapon, most likely a raking blow from a lightning claw. 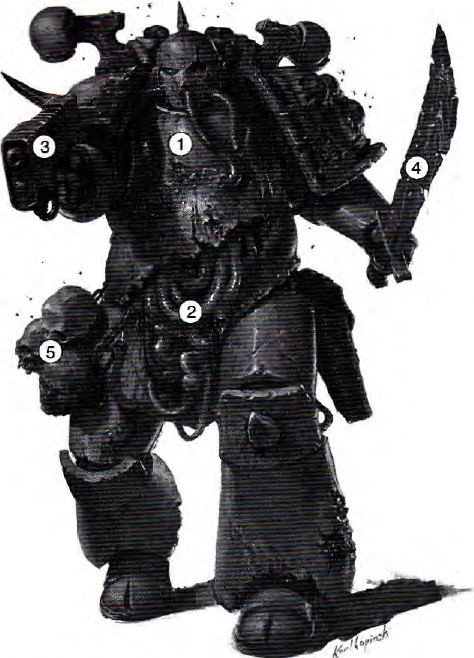 The damage would have been terminal even for a Space Marine's enhanced physique, but to this Death Guard Marine the damage was merely superficial. The flesh of the Plague Marine is bloated, distended and corpulent, seething with organic corruption and decay and terrible to look upon. The stench alone given off by them is enough to incapacitate. This seemingly dead and decaying flesh however makes the Plague Marine almost impossible to stop with conventional small arms fire, and they are able to shrug off injury and damage that would commonly defeat even the superhuman physiology of the Adeptus Astartes. In combat against these horrific servants of Chaos, mass concentrated firepower or weapons more commonly employed to deal with armoured vehicles are recommended as the key to a successful confrontation. The decaying flesh also attracts maggots and flies. These creatures commonly accompany all Nurgle's forces, and some even cultivate them, considering them sacred creatures. Blistering through the armour's shoulder pads are maggot hives which constantly produce large fat black flies. In contrast to the Plague Marine's other equipment, this plasma pistol appears to be a more recent Imperial model, probably a Mk XI or XII 'single core' pattern, likely taken from the spoils of war on the battlefield. Already showing signs of corruption and ill-repair, the tortured machine spirit of this weapon will likely make it prone to catastrophic magnetic field failure and hazardous thermal flashbacks which would likely kill a human operator. However, given the Plague Marine's unhallowed tolerance for injury and pain, the dangers are likely to prove inconsequential to this malignant warrior. Of unknown origin and design, the Plague Marine carries a 'cleaver' type combat weapon of the sort often, and not inaccurately, named a "Plague Knife" by Imperial observers. Wielded with the superhuman strength and speed of these creatures, these unpowered blades can pierce most forms of body armour, and can breach the protection of ceramite powered armour if a vulnerable location is struck. If the skin of a victim is cut, the contaminated and necrotic slime that covers the blade will almost invariably infect the wound and poison the bloodstream, leading to a slow and agonising death in over 90% of cases. Even the augmented metabolism of the Astartes is not entirely immune to this effect. As yet the Adeptus Biologis have no antidotes that have any effect on the toxins. Rumours persist that some of these weapons are further empowered by the dark taint of the Warp against which no flesh can be spared. Only the Ordo Malleus know the truth. Also known as a 'death head' grenade, it is made from a conquered foe of Nurgle. Constructed by Nurgle sorcerers, the severed head is covered with a waxy mix of slime and blood until it is watertight. The brain cavity is then filled with pus and left to fester, becoming a poisonous gas. The result is a missile which bursts on impact, releasing a deadly acidic gas.